In Germany, near Lake Constance in the late 1940s, a reed maker, Gebhart Steuer, called on Honorat Donati, a producer of music reed cane. This cane, Arundo donax, known for its exceptional vibratory qualities, grows along the shores of the Mediterranean, in the Var area of France. The Donati family in Carqueiranne knows the secrets of good reed cane production. Simultaneously fragile, flexible, and strong (it bends but does not break), this long stem, from which the delicate little musical reeds will be produced, requires a great deal of care. A reed cane stem is a living thing. As with a child, its development must be watched over with close and constant care. The reed cane is grown with Passion. Only an adaptable wood, which has been able to bend and develop its “muscles” at the mercy of the wind for many long months, can provide this combination of flexibility and sturdiness, essential to the demands of the Artist. This is how the reed is able to meet the musician’s requirements. And meeting these requirements will also depend on other factors, including a good match between the reed and the mouthpiece of the instrument, and the artist’s state of mind when playing: their emotion, their sensitivity. Every artist has their own different sonority. After this initial contact all those years ago, many other trips from the Var region took place to visit the Steuer business, taken over by Hans and Dorothe Gillhaus in 1997. In 2011, after several decades, nothing could be more natural than the Steuer company now being based in Carqueiranne, in Var, close to the musical reed plantations. 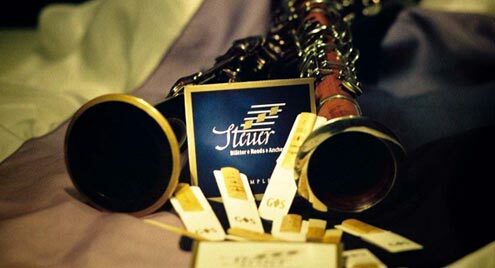 It is here that Steuer now continues to create and produce reeds to the highest standards, so essential to musicians, in keeping with the tradition of excellence which has forged its reputation. The reed has come back to the land of its roots.